When a user installs WorkJam on their mobile device, the app requests certain permissions from the user. Users sometimes have questions about these permissions, so this page explains why some of these permissions are requested and how they are (and are not!) used. No one at WorkJam or the company you work for can ever see the photos or downloads stored on your phone. This permission is used only when you wish to upload a photo, video, or file to WorkJam (for example, uploading your profile picture or posting an image to a channel). The permission allows the app to access the camera or photo folder so you can choose what to upload to WorkJam. The only data the WorkJam service will receive are the images that you choose to upload to WorkJam. For example, if you have a photo of yourself and a photo of your dog on your phone, and you want to add the photo of yourself as your profile picture, WorkJam needs access to your photos to be able to connect and and allow you to choose the picture. However, only the photo you select is sent to the WorkJam servers and added as your profile picture, so no one at WorkJam or your company has access to the picture of your dog. The photos and data on your phone remain private and can only be seen by you. Location services are only used if your company has chosen to restrict by location the ability to punch in for a shift, or the ability to take a training or other location restricted feature (i.e. you can only use these features when you are at work). When you attempt to access one of these features, WorkJam checks your location to confirm that you are in the right spot to use it. WorkJam only checks your location at the time you attempt to use the feature. Turning location services off will not share your location with WorkJam, however this may restrict certain features such as being able to punch in from your phone or being able to access trainings that can only be done on-site. Your company does not have access to your location data and the app does not track your location movements. 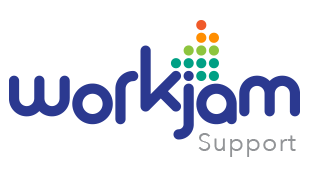 If you have any further concerns regarding privacy, we recommend you contact your company's internal support for the specifics of their configuration with WorkJam.